Yesterday, the first senior leaders of the Khmer Rouge were charged guilty of “crimes against humanity” or genocide. The two old leaders were given life sentences. In the last hundred years alone some of the most evil people in history have walked the earth. They include: Adolf Hitler who killed more than 12 million people, mostly Jews; Joseph Stalin is estimated to have killed 13 million people in Soviet Gulags; Mao Zedong, one of the few whose government is still in firm control, is considered a national hero in China and was responsible for some 11 million deaths in his ethnic purge of the so called “cultural revolution” though some estimates reach as high as 50 million people killed in China. Japan in WWII executed some 5 million people. Cambodia faced a horrible tyrant named Pol Pot who executed and starved to death some 3 million of his own people. Cambodia being a small country of seven million people lost almost 40% of its total population. It is probably impossible for most people to image how horrible it would be for every single family in the entire country to lose some, if not all their family members. Cambodia is one of the few cases in the world were a genocide was carried out among the same people. Most other genocides are against minorities. The Khmer Rouge killed plenty of minorities too, such as the Kola people (now reportedly only 31 left in the world), Cham, ethnic Chinese and Vietnamese to name a few, but most who died were Khmer: from the very same ethnicity as Pol Pot himself. I have often thought, when watching an old documentary or war movie, what would I do it I had the chance to get near one of these most evil men? Would I even dare to try to kill them? Wouldn’t the world be better without them? Will they ever receive justice for what they did? Of the mass murders pictured only one, Saddam Hussein, ever faced trial. The others were buried as heroes. They continued their oppressive control of others and genocide until they died of old age. Nearly all of my wife’s family, Noit, was executed or died from starvation under the Khmer Rouge. The biggest tourist attractions in Phnom Penh are the genocide museum and one of the 20,000 killing fields scattered around the country. The only complete census of the genocide revealed that more than 3,000,000 people died under the Khmer Rouge reign of less than four years. (A UN committee gave an estimate of 1.6 million which is often quoted, yet not based on any census or study.) Noit was 11 when the Khmer Rouge took over. Her father was executed, nearly all of her brothers and sisters all died of cholera and starvation. They were worked to death with little food. Her grandmother, aunts and uncles, cousins, nieces and nephews all died before her very eyes. Her own mother died of cancer, left untreated by the Khmer Rouge, shortly after liberation. Only one sister survived with Noit, out of more than fifty family members and relatives. Pol Pot was the leader of the Khmer Rouge, but one of the ideological leader was one of Cambodian’s most brilliant leaders, Khieu Samphan. His own doctoral dissertation written in France some 15 years before the Khmer Rouge came to power described his extreme communist ideology and the need to purge society of all “city dwellers” and those influenced by the West. I have often traveled into the Khmer Rouge areas today for the purpose of sharing the gospel. The head of Khmer Rouge propaganda became a Christian and has been broadcasting our daily Christian radio messages for three years for his comrades. Some 50,000 former Khmer Rouge soldiers can hear the daily broadcasts. It has taken since 1979 to try any of the Khmer Rouge leaders. Khieu Samphan was the Head of State of Democratic Kampuchea. He took over full control of the Khmer Rouge in 1983 when Pol Pot became ill.
Over the year working in remote jungle locations and mixing with former Khmer Rouge soldiers, I have often contemplated about what I would do if I ever saw one of these senior leaders. Would it be a sin to hit them with my truck? Should I try to attack them with my bare hands? Would killing them bring justice to my wife and her family, or the other 3 million who were killed? Of course I could never imagine meeting such a leader. . . It was all just day dreaming. In October of 2005 I was in the former capitol of the Khmer Rouge, Pailin city. 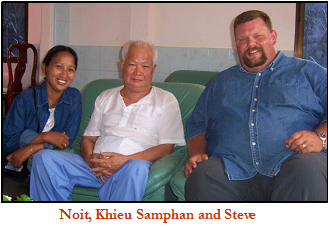 My wife and I were talking to the Khmer Rouge Propaganda director and he dropped the name of Khieu Samphan whom he has recently visited. Noit jumped quickly on the comment and asked if it would be possible to meet him. To our shock, he said “no problem”. He called and set up the meeting for the next morning. I didn’t sleep a bit that night. I thought of the irony of how other people get to shake the hand of the President of the United States or meet a celebrity and the most important person I had met would be the Head of State of the Khmer Rouge who was responsible for killing 3 million people, including my wife’s family who was going with me! What would I do? The next day came and I was determined in my mind what course of action to take. In a matter of weeks Khieu Samphan will be brought before an international tribunal to answer the charge of “crimes against humanity”. At his home, there were no body guards, no fence, and no weapons in view. Khieu Samphan came into the room and sat right across from me and Noit and next to a friend of mine from America (Greg) and also another staff member (who was also orphaned by the Khmer Rouge). It was hard to concentrate at first because I thought of the opportunity before me. This was an old man with no security. I could relieve the world of him with one hand. No problem. As I contemplated my power to kill him I also contemplated my power to bring him life. He wanted to talk about politics, so we politely indulged him. He speaks English, French and Khmer fluently. He was avoiding speaking in Khmer. Finally the door opened when he said, “my comrades are in despair in Cambodia.” Greg quickly responded that Christians believe that Jesus can bring hope. He spoke in English but I wanted to speak to his heart so I spoke in Khmer, then Noit shared about how Jesus had lifted her out of hopelessness and into joy. For nearly an hour after the initial hour of politics he tried to get away from talking about Jesus. . . But he heard the gospel message of Jesus Christ clearer than most will ever hear. He didn’t accept Christ. He is a die-hard humanist. But who knows if a spark was lit. He invited us to visit him again later (if he is not in jail). In November of 2007 he was arrested by the UN and Cambodian Court called the ECCC. Only lawyers could speak to him since then. Yesterday, August 7, 2014 he was convicted of genocide and given a life sentence. Now I know what I would do if I met the likes of Adolf Hitler. I would offer him life, not death. I really believe that Christ is the only answer for the world and Christ is the only answer for Khieu Samphan. On that day there was justice for Noit and her family. As an old man he will soon face justice in eternity at the hands of Almighty God. God has had Noit in His hands for many events that are “for just a time as this”. My wife is Khmer and she says she is not aware of any Khmer Rouge dominated regions in Cambodia (or Thailand) anymore. What constitutes such a region? The “former Khmer Rouge” who joined with the government (never surrendered) in 1998 were given their areas which they controlled as separate provinces. These provinces are Oddar Meanchey and Pailin. Most of the leadership there remains “former Khmer Rouge”. Thanks for the info. I got family members there that tend to think the Vietnamese occupation (at least right in the beginning) was worse. Good job in writing and describing this event. I have been very interested in this tragic and often disregarded part of world history for some time. There are people (mostly atheists) who not only question the existence of God, but are skeptical about the existence of Satan. For them I simply point out the incidents of mass genocide such as what the Khmer Rouge performed as evidence of Satan. The Cambodian people are well-known for their warmth and hospitality; it’s ingrained in their culture and character. So just how could Pol Pot and his cronies – who were themselves Cambodian – ever commit these atrocities against humanity unless they were tempted (or perhaps even possessed) by some wicked supernatural being? And when you question what you would do if facing murderers such as Hitler, Stalin, Pol Pot, etc., remember God does admonish us: “Vengeance is mine and retribution…” (Deut. 32:35). It is not for us to be judge, jury, and executioner. These men will get their comeuppance in due time and it will be from someone a lot bigger and more powerful than they could possibly ever imagine! I’d like to hear their excuses for acting the way they did before Him.